Emerick is heading up the project with the Christman-Brinker team, a Detroit-based joint venture overseeing construction management of the project, extending the ongoing Michigan Made, Detroit Built efforts taking place throughout The District Detroit. The Mike Ilitch School of Business is one of several active construction projects currently underway within The District Detroit. The new business school is located just north of Little Caesars Arena in the Woodward Square neighborhood, which will also be home to new retail, residential and office developments in the future. Christman-Brinker is not the only Detroit-based company leading the Mike Ilitch School of business— Detroit-based architectural firm SmithGroupJJR led the development of the updated design and several Detroit-based subcontractors, such as Ideal Contracting, are building the structure from the ground up. 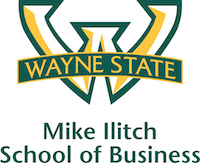 Classes begin in 2018 at the new business school, which was made possible by a $40 million gift from Mike and Marian Ilitch, the largest gift in history to Wayne State University, helping Wayne State extend its campus south near the rapidly progressing Little Caesars Arena and closer to the city’s Central Business District. The Mike Ilitch School of Business will serve more than 3,500 undergraduate and graduate students and provide flexible teaching, research, office and community spaces for students and faculty. The District Detroit will ultimately account for a total economic impact of more than $2 billion and create more than 12,500 construction and construction-related jobs in addition to 1,100 permanent jobs. Watch the work happen live at districtdetroit.com/bschool. The Wayne State University Mike Ilitch School of Business prepares students for challenging and rewarding careers, advances the boundaries of scholarly and practitioner knowledge, and enhances the economic vitality of the city of Detroit, the state of Michigan and beyond through its programs, research and community engagement. Established in 1946, the business school was renamed in 2015 in recognition of a $40 million gift from Mike and Marian Ilitch. Thanks to this lead investment, a new state-of-the-art building is slated to open in the heart of the District Detroit in 2018, and entrepreneurial programming and collaboration with city businesses are expanding. For more information, visit ilitchbusiness.wayne.edu. ?